This all-in-one unit includes six total speakers delivering all of the power you need to hear your music while you are speeding over land or water. Total size is 21-3/8" long, universal mounting clamps fit 1.75" and 2.00" bars. Built to withstand anything and can be washed off without worry. The integrated Bluetooth receiver allows you to stream music directly from your smartphone or tablet or you can direct connect your device via an external 3.5mm input. 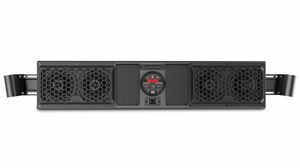 Additionally, the unit includes a 3.5mm auxiliary output allowing you to integrate an external amplifier and subwoofer if desired or to go out to another MUD6SP for even greater sound coverage. Pro UTV racer Justin Quinn installed the MUD6SPBT in his Polaris RZR vehicle so he could enjoy his music while racing. He tore the course up at the 2016 UTVUnderground World Championship and the MUD6SPBT didn't miss a beat.